The digital music maven hit several ups and downs in November, giving investors a welcome bounce from October's terrifying plunge. Here's what you need to know. 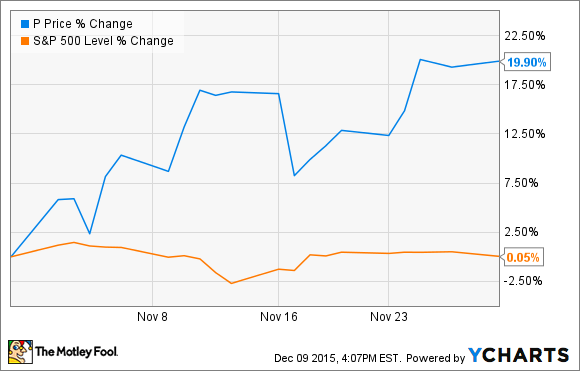 What: Shares of Pandora Media (NYSE:P) gained 19.9% in November, according to data from S&P Capital IQ. It was a bumpy ride, but a climb in the end anyhow. So what: In early November, Pandora shares rose 5% as the company struck a new licensing pact with Sony (NYSE:SNE) and its music publishing arm. The new terms appear to mean more money for Sony's stable of songwriters, while Pandora gets to sidestep the uncertain regulatory environment regarding this major content producer. Later, the stock surged another 9% as the rumor mill started talking about Pandora's international expansion plans. This would be a major growth driver for many years, but Pandora must first reach overseas licensing agreements with the big music studios -- or risk it all, navigating the uncharted waters of multinational copyright law. Then Pandora said it wants to buy fellow digital music specialist Rdio. For $75 million, Pandora gets most of the now-defunct music service's assets. But investors hated the idea, and share prices fell 8% on the news. Finally, pop star Adele decided to keep her new album out of competing services such as Spotify and Apple (NASDAQ:AAPL) Music, while giving Pandora full access to the record-breaking release. The stock jumped 7% on this revelation. So there were lots of ups and downs, but a 19.9% single-month gain overall. Now what: Of course, Pandora was climbing back from a deep, dark well. Shares fell 46% in October, hamstrung by a nerve-wracking earnings report for the third quarter. All in all, the stock is trading down more than 25% year to date. Unique content deals like the Adele scoop can only help so much. It's not like her music is becoming exclusive to Pandora -- you'll still hear her on the radio, find her videos on YouTube, and buy the tracks from iTunes (Apple's other music service). So that's a step in the right direction, but far from a silver bullet. The real silver bullet would be to hammer out proper licensing deals like the new Sony contract with all of the major music publishing houses -- and on a global level. Of course, this is easier said than done and could still take years. Pandora investors need to keep a close eye on its licensing progress, because that's the key to the entire business model.